The new crankshaft has five 2.000 inch diameter main bearing journals. Crankshaft thrust is controlled at the rear main bearing. Generous fillets are used throughout to mitigate stress risers. The new crankshaft has four .1875-inch diameter drilled oil passages from the front, center, and rear main bearing journals that supply pressurized oil to the connecting rod journals. Counterweight calculation is an engineering determination of how large the counterweights should be. Counterweight calculation is different than balancing. Balancing is making things equal. A stock Model A crankshaft (without counterweights) is balanced when it’s center of gravity lies along the centerline axis. Small amounts of weight are added or removed to get the center of gravity on axis. Balancing can be either static (pistons, wrist pins, and connecting rods) or dynamic in the case of things that rotate (crankshaft, flywheel, etc). Stock Model A and 1st generation Model B crankshafts have no counterweights. The 2nd generation Model B crankshaft had integral counterweights equivalent to about 40% of modern engine standards, and the late ‘30’s factory rebuilt Model B engines had pressed on counterweights equivalent to about 60% of modern engine standards. In both cases, the counterweights are placed on one side of the connecting rod instead of being equal on both sides of the connecting rod as on a modern engine. Placing the counterweight on one side introduces cyclic bending loads into the crankshaft (deflection and fatigue) with every revolution. These cyclic loads increase as the square of the RPM. Each doubling of RPM causes loads (stresses) and deflections to increase four times. 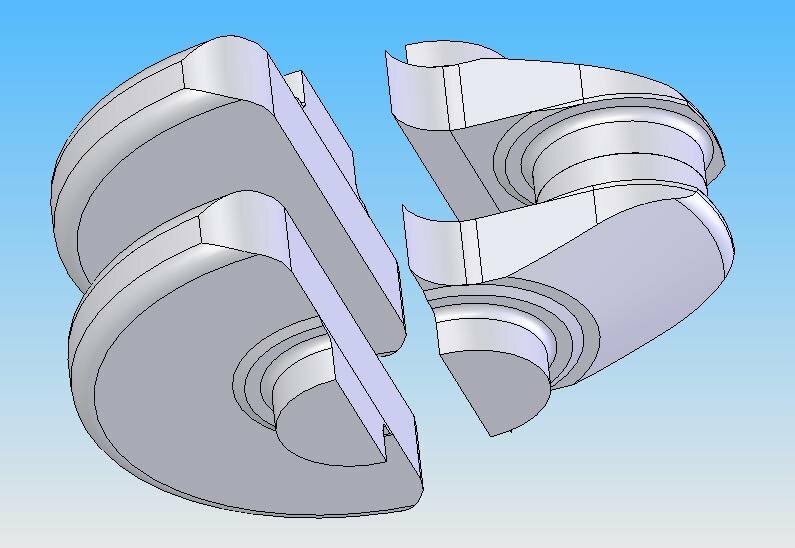 The new crankshaft resulting from this engineering study has a pair of identical counterweights for each cylinder that are spaced equally fore and aft from the connecting rod as on a modern engine. These counterweights take care of what engineers call "first order effects" as they reduce crankshaft stress and deflection. Figure 4 is an exploded view that illustrates the pair of identical counterweights on the left and the crank arm on the right that is used for each cylinder. The equation used to determine the amount of weight for the pair of counterweights is shown below. There was just enough room in the crankcase for the 100% counterweights if they are made from the same material as the crankshaft (ductile iron). The counterweights could become less if the crank arm, connecting rod, or piston were lighter. The counterweights could also become smaller and have the same effect if they were made of a denser material such as tungsten. Second order vibration effects are another problem. Modern inline four cylinder engines incorporate two balance shafts with counterweights turning in opposite directions and at twice engine RPM. These balance shafts cancel a second order vibration caused because the two ascending pistons and two descending pistons do not always have identical opposing acceleration. Remember the connecting rod accelerations calculated earlier at TDC and BDC (+1936 g’s and –1081 g’s). Counterweights reduce crankshaft deflections and stress, but balance shafts do not. Balance shafts reduce loads on items external to the engine and increase passenger comfort. Since balance shafts do not reduce stresses in internal engine components and since there is no physical room for them in a Model A crankcase, they have not been considered in this engineering study. The forward end of the new crankshaft is identical to the forward end of a stock Model A crankshaft so all of the interfacing parts (key, gear, slinger, pulley, ratchet nut) fit without modification. At the rear of the new crankshaft, the flywheel interface and location is identical to a stock Model A, however the flange is much thicker. This thicker flange is required to provide a sealing surface for a pair of radial lip seals described later and an added benefit is that it shortens the length of the rear main journal, which results in a stiffer crankshaft. Figure 5 is an illustration that shows the new crankshaft from the rear. The flywheel mounting holes and dowel pins are not shown. The weight of a stock Model A crankshaft is 28 lbs. The 2nd design Model B crankshaft with integral (40%) counterweights weighs 47 lbs., and the late ‘30’s factory rebuilt Model B crankshaft with pressed on (60%) counterweights weighs 60 lbs. A crankshaft from a 176 in*3 Offenhauser engine that produced 460 HP in 1950 weighed 67 lbs. (Walton, Offy, pg 121). 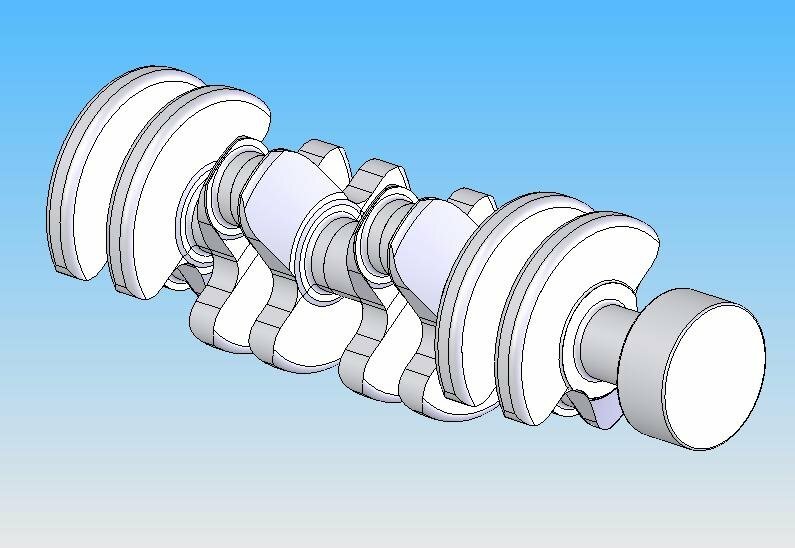 The new design crankshaft with 100% counterweights made from the same material (ductile iron) weighs 90 lbs. If the counterweights contained tungsten (added cost), overall crankshaft weight would drop substantially.